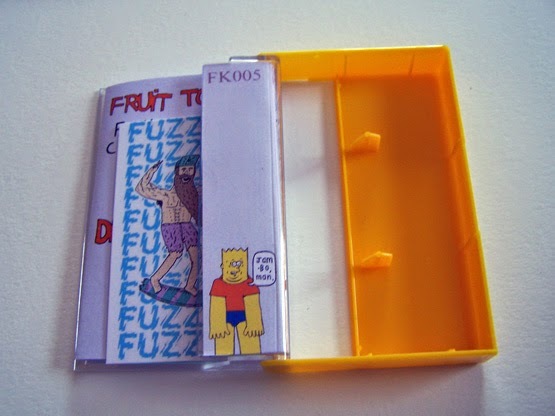 With every split cassette I receive, it only furthers my love of split cassettes. 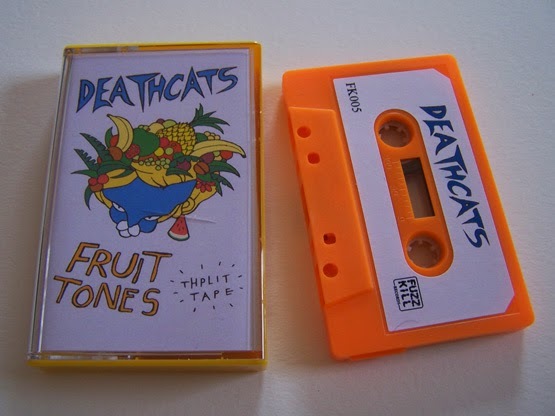 As I listen to this one, I begin to wonder whether or not bands had split cassette back in the 1980’s or 1990’s, and I’m pretty certain that even with records and CDs, bands that would be on fairly major labels would never really do splits and that’s just a damn shame. If they had a Peter Gabriel/Phil Collins split tape I’d be all over it. 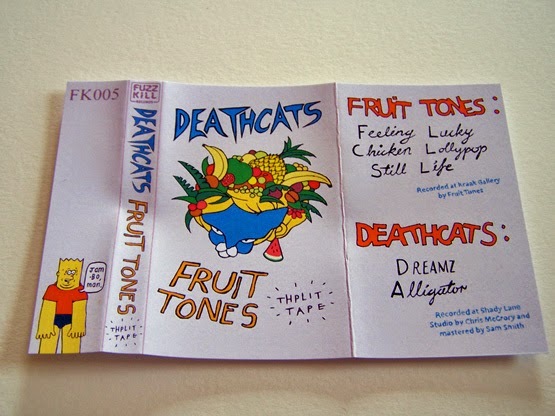 This is three songs from Deathcats and two from Fruit Tones, but the last song from Deathcats is a little bit shorter and all so it kind of ends up making sense and really evening out. 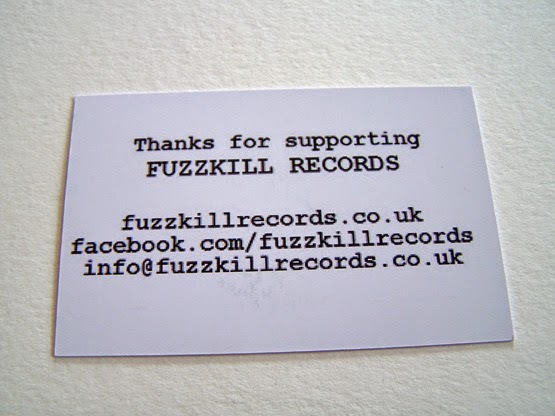 Deathcats have a sound of distant, distorted garage rock n roll. 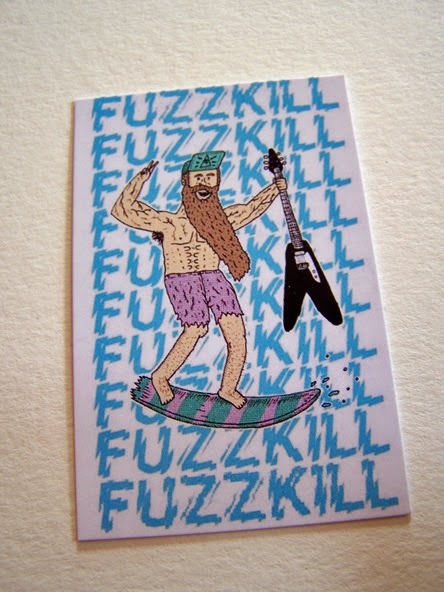 They’re like The Killers, Monkees or Vines only they are actually good. They hit fast and they hit hard, like a less angry version of Tora Tora Torrance, who were themselves one step away from being Refused. Their third and final song is instrumental and has the feel of a cheesy television theme, which most easily pulls up to my memory The A-Team for whatever reason. 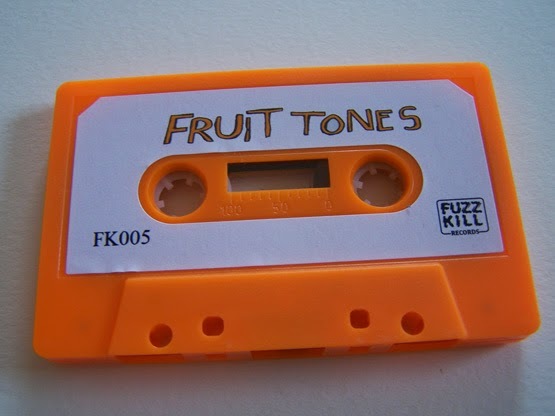 On the other side of the cassette, Fruit Tones are more of a guitar driven rock n roll sound. 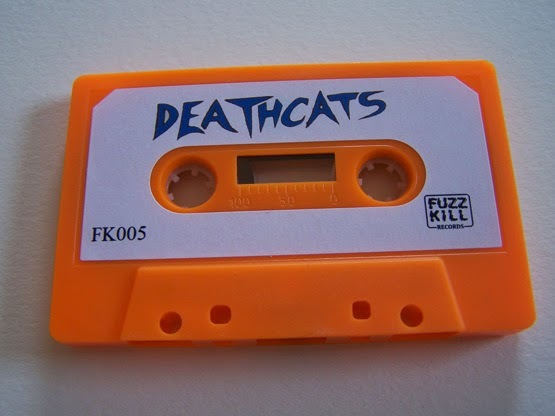 They could easily play a show with Deathcats, yeah, but not so easily be mistaken for them by the trained ear. They also have this sort of underlying guitar chord rhythm that reminds me of something from the punk/ska days, such as a ska band without horns, that’d be like Suicide Machines or Assorted Jellybeans, but that’s only a little faint portion of this. 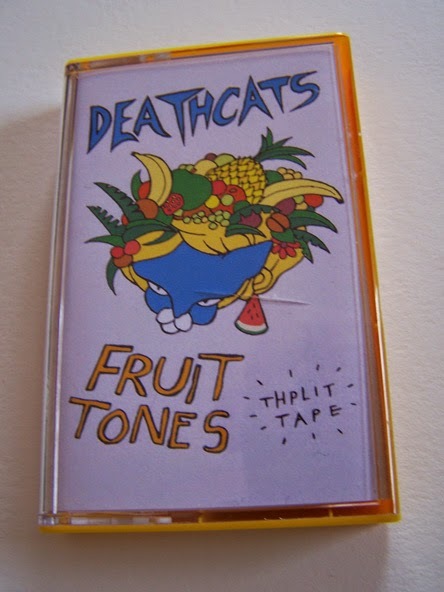 There exists a label that releases cassettes and always seems to claim they are the best garage/punk/rock n roll, and while I only occasionally like some of their bands when I feel like I should be enjoying them all, both of these bands here are prime examples of what I feel like any band should sound like that wants to be good.